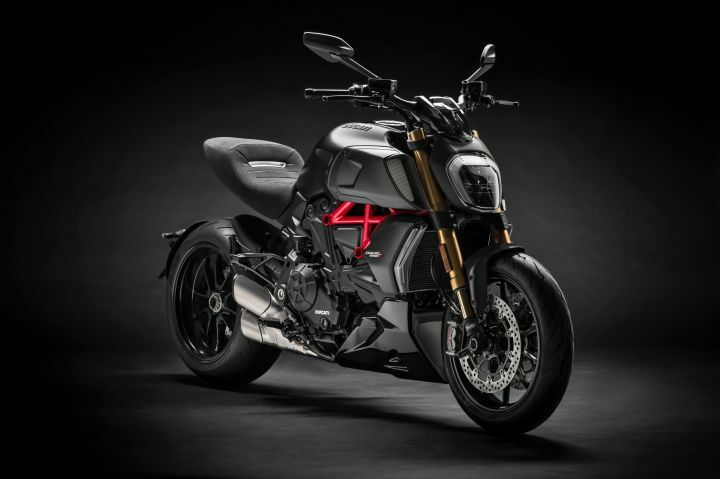 Ducati has pulled the wraps off the second-gen Diavel 1260 and 1260 S at the Ducati World Premiere, just two days ahead of the 2018 EICMA motor show in Milan, Italy. The latest iteration of the power cruiser gets a new and larger 1262cc DVT L-twin motor instead of the 1198cc engine that powered its predecessor. Power is up by 15PS, to 159PS, as is torque, from 123Nm to 128.8Nm. Ducati says the new motor has been tuned for better low rev response and should be docile enough for everyday use. To cope with the new motor’s power output, the trellis frame has been updated to behave well even on B-roads. The long trellis chassis has been replaced with a short trellis frame that mounts the steering head straight onto the cylinder heads, much like other Ducati sportbikes. Front steering rake has dropped by 1-degree and now sits at 27 degrees while trail has dropped by 10mm. Wheelbase meanwhile has grown by 20mm. Lean angle is now 41 degrees on both sides. The bike weighs 5kg more than before while seat height has gone up by 10mm. Like its predecessor, the new motorcycle gets all kinds of riding aids as well as Bosch cornering ABS to keep things in check. The hotter Diavel 1260 S gets fully adjustable Ohlins suspension at both ends, different alloy wheels, top-spec brake components and bi-directions Ducati Quick Shift as standard. In terms of design, the Ducati Diavel 1260 and 1260 S stay true to the lines of the original power cruiser that debuted at EICMA back in 2010. However, the new bikes look a lot more aggressive and feature sharply raked lines. Meanwhile, the tank extensions are smaller and now feature more pronounced air ducts, while the new headlamp features all LED lighting. The front LED turn indicators are smartly integrated into the radiator shrouds. It gets a smaller twin exhaust now. Other features include a digital TFT screen, keyless ignition and a multimedia system. We expect the new Diavel 1260 to replace the Diavel in India sometime next year. Expect to pay around Rs 50,000 more over the current Diavel’s retail price of Rs 16.1 lakh (ex-showroom India). Ducati is expected to showcase the new Diavel 1260 along with the rest of its range at the EICMA 2018 motorcycle show. So stay tuned for more updates. Share your experiences with Diavel 1260?